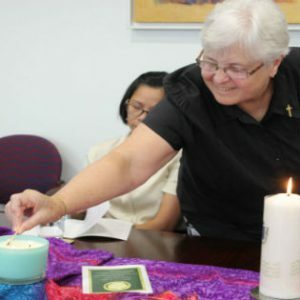 In late March, the Congregational Leader, Sr Clare Nolan, installed Sr Libbey Byrne as the new Director of Sisters in Temporary Profession in a ritual at the Bondi Junction offices of the Sisters of Charity. 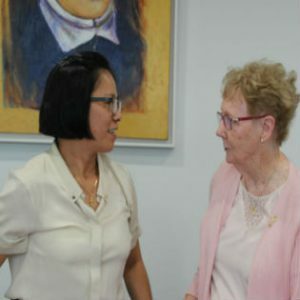 The previous Director, Sr Regina Millard, handed formation documents to Sr Clare as symbol of ending and welcomed our Sister in Temporary Profession, Amanda Nguyen, to continue her journey with Sr Libbey. (Sr Amanda renewed her vows for two years during a liturgy in January.) 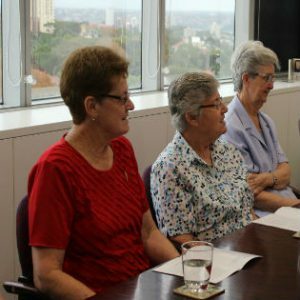 Sr Amanda, and members of the Leadership Council, Srs Margaret Beirne, Cate O’Brien, and Suzette Clark, were also joined by the members of Sr Amanda’s new community in Sydney, Srs Frances Graham, Cecilia Kinsella, Jean Montgomery, Gaye Reynolds, and Margaret Valentine. Sr Clare then called Sr Libbey forward and entrusted to her the Formation documents – a symbolic of carrying forward what had already begun. It was a moving and heartfelt ritual, one which mirrors Sr Libbey’s long-term ministry of faith formation. Her role with Sr Amanda fits perfectly with her other ministry in the Diocese of Maitland-Newcastle. 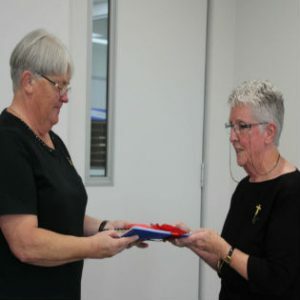 While Sr Libbey was talking about her role as parish leader at Myall Coast Catholic Parish (encompassing St Brigid’s, Bulahdelah; Our Lady of the Rosary, Karuah and St Stephen’s, Tea Gardens), it reflects the core of her expression as a Sister of Charity. “While her home is at Tea Gardens, Libbey has pastoral responsibility for the communities that gather around each of the three churches, often participating in clergy gatherings along with other lay leaders. It’s nothing for Libbey to clock up 1000 kilometres in a week.” Aurora reported. One of the younger members of the community, she became a Sister of Charity after she had finished her teaching qualification. “Previously, others had gone into the novitiate around 17 or 18. I was 26, so my own experience was very different from that of other, older Sisters, and even of Sisters who are around my age. It will always be completely different from Sr Amanda’s expereince, who is just turning 50. That thought was quickly followed by ‘no, no, no, not me, Lord.’ I was having too good a time.” But eventually she did understand her call, and entered. No one was more surprised than Sr Libbey when she got to her Silver Jubilee of profession. You might put her longevity in ministry to her passion – for the past 25 years she has worked on faith formation both within and outside the Congregation. And Sr Libbey has been enabled to pursue that passion. She was away at Boston College, completing her masters in pastoral ministry and spirituality for nearly two years from 2000. On her return, she has been living on her own and ministering in places in and around Sydney. For the last three years, she has been in Tea Gardens. And there is something else coming up… With Srs Margaret Beirne, Adele Cottrell-Dormer, Anne Taylor, and Tess Marcelo, she will be developing a new vocations and faith formation ministry for the Congregation. That seems like more than enough to keep the dedicated and passionate Sr Libbey busy!